The pair quickly bonded and smiled for a photo together, which Terence then shared on Facebook as a reminder for other people in these tumultuous times. 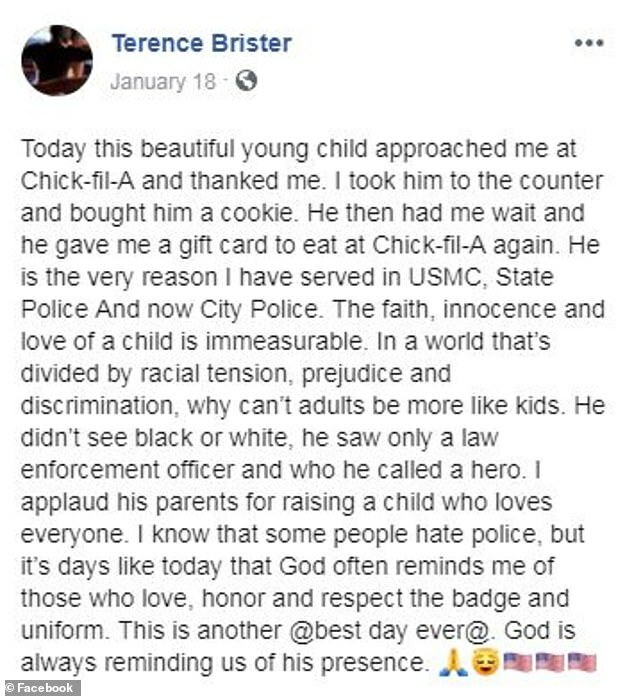 Terence, a Marine Corps vet, currently serves as a police officer in Greenville, South Carolina. And on Friday, he had a pretty good day at work. 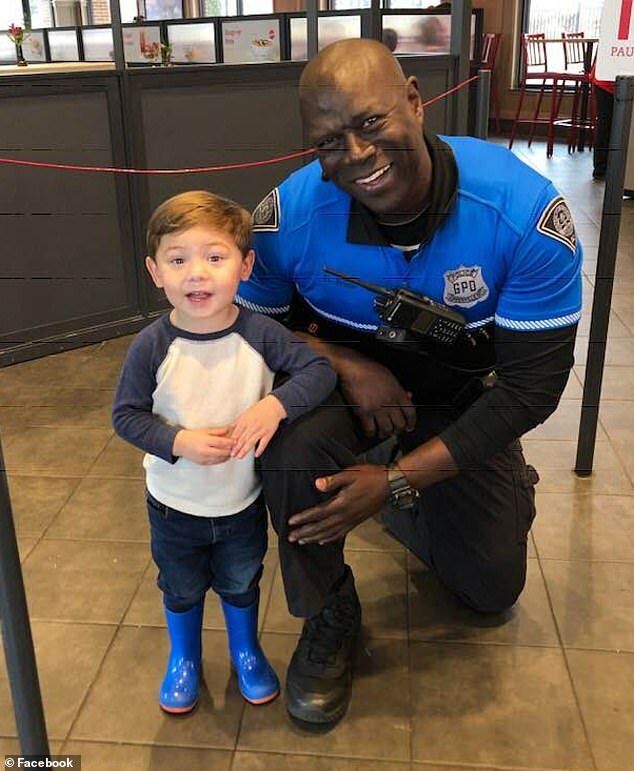 'Today this beautiful young child approached me at Chick-fil-A and thanked me,' he wrote, captioning a photo of himself crouching beside the smiling boy, who is resting an elbow on his knee. 'I took him to the counter and bought him a cookie. He then had me wait and he gave me a gift card to eat at Chick-fil-A again. 'He is the very reason I have served in USMC, State Police And now City Police. The faith, innocence and love of a child is immeasurable. In a world that’s divided by racial tension, prejudice and discrimination, why can’t adults be more like kids. 'He didn’t see black or white, he saw only a law enforcement officer and who he called a hero. 'I applaud his parents for raising a child who loves everyone. I know that some people hate police, but it’s days like today that God often reminds me of those who love, honor and respect the badge and uniform. 'This is another @best day ever@. God is always reminding us of his presence,' he concluded. The picture has quickly spread, with over 170,000 reactions and 65,000 shares so far. According to WYFF, the little boy's mother, a North Augusta woman named Cara Bryan, shared the post and added comments of her own. 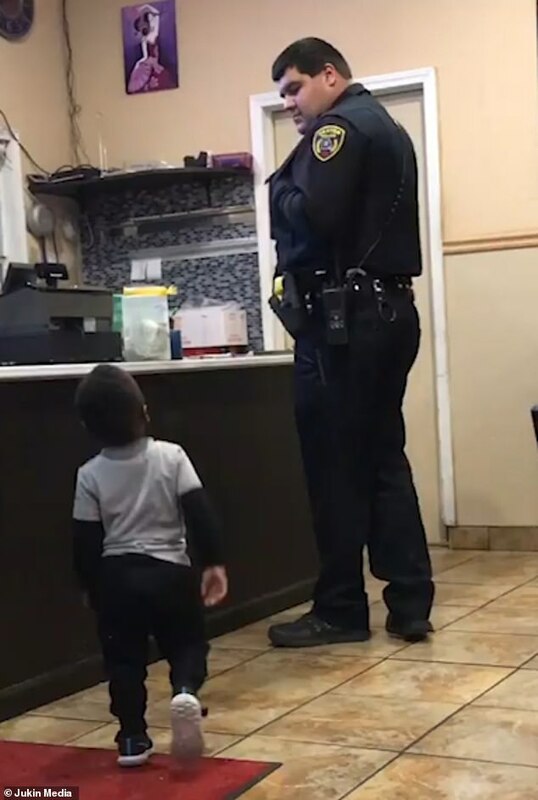 It's not the only time this month that a heartwarming reaction between a child and an officer of the law went viral. 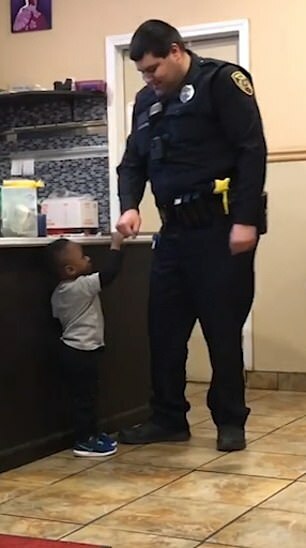 Earlier in January, a video filmed in Dexter, Missouri, showed a cop and a little boy sharing a hug and a fist bump. 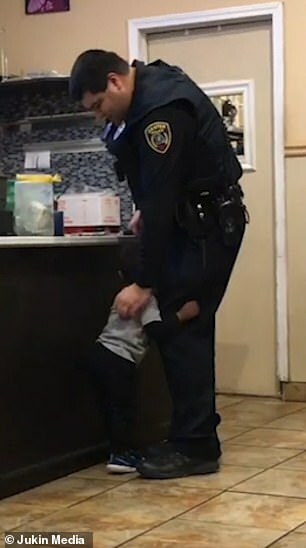 In the clip, the cop is seen standing at a counter waiting for his order when a little boy wanders up to him. The cop smiles and says: 'Hey! What are you doing? '.